Disclaimer: I know most of you won’t have the credit to do something like this, but this is an example of what is possible when you are careful with your credit and are able to jump on an opportunity when it comes available. By following the steps in our Credit Repair 101 article, you can start your way back to a credit line that can make something like this possible for you. Buy enough $500 gift cards to purchase the amount of goods you want to buy. Log into your UPromise account and click through to Sears a second time. In my case, I had a high credit limit on my Chase Sapphire Preferred card that had a zero balance so I timed my purchases to hit my account right when the statement cycle began. This would give me almost 2 months before my payment was due and plenty of time to sell the tablets. I decided to go big and bought $24,000 in Sears gift cards which would give me 240,000 Ultimate Rewards points. I also picked up another 24,000 points for the spend. I obviously got a call from Sears security department to verify the transaction but soon had 48 $500 gift cards available and a few weeks later 240,000 UR points! 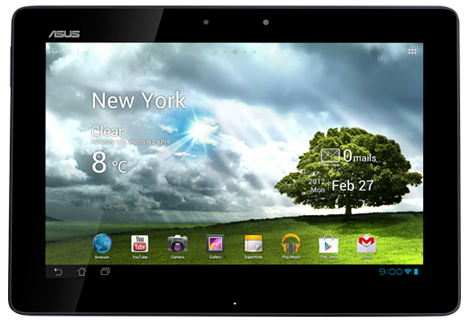 I was able to catch a good sale on Sears.com for the Asus Transformer TF300 Tablets for $349.99 which after tax and free shipping cost me $374.49 each. After logging into Upromise.com, which gives 5% cash back for Sears.com purchases, I bought 64 tablets for a total of $23999.36 and used the gift cards to pay for it. I talked about UPromise cashback before in my iPhone 5 article so hopefully you already have an account with them. I did have to break it into groups of 10 tablets per order. Since I am a member of their ShopYouWayRewards program, I also got 1% back in points (222,528 points that I can use as a $222.53 credit towards a future sears purchase). I received $1162 in cashback from UPromise for the order. Once the tablets arrived, I immediately shipped (at a cost of $63) them off to Amazon.com for sale via their Fulfillment by Amazon program. They handle the marketing shipping and billing and take a cut from each sale. I’m not going to delve into the details of that too much today, but I ended up selling almost all of them for $399.98 (1 cent less than the Amazon price) which after all of the Amazon fees netted me $374.99 per tablet, or $23999.36 or almost exactly what I paid! They direct deposit the funds right into my checking account two weeks after the sales which I then used to pay off the credit card. So at the end of the day, I ended up with 264,000 Ultimate Rewards points, $1162 in cash back from UPromise, and $222 in credit for a future Sears purchase! So in essense I just got paid to get over a quarter million points! To put that in perspective, that is enough for 4 round trip coach tickets to Europe on United, or 26 round trip tickets from Miami to Cancun on British Airways! Wow! Several things could have gone wrong with this plan such as the price on the tablets dropping a lot before I could resell but I figured I had 30 days at Sears to return if things started falling apart. If this sounds interesting to you then take a look at our Getting Started page and join me in the points and miles game! Feel free to put any questions you have about this process in the comments and I will answer them.